From the drug-infested streets of West Baltimore to the corruption of City Hall, The Wire chronicles the tribulations of a post-industrial American city. Viewed from the perspectives of both the police and their targets, the award-winning series captures a world where easy distinctions between good and evil, and crime and punishment, are challenged at every turn. Special Features Bonus Material May Not Be In High Definition. Audio & Su..
Candid and intense, The Wire has been hailed as one of the great achievements in television artistry. 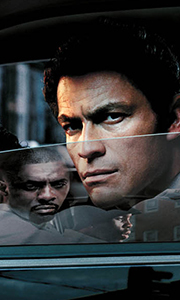 Viewed from the perspective of the principal characters - the police and their targets - The Wire captures a world where easy distinctions between good and evil and crime and punishment are challenged at every turn. The series first season concentrated on the often-futile efforts of police to infiltrate a West Baltimore drug ring. Seaso..
From David Simon, creator and co-writer of HBO's triple Emmy-winning miniseries The Corner, this unvarnished, highly realistic drama series follows a single sprawling drug and murder investigation in Baltimore - one that culminates in a complex series of dangerous wiretaps and surveillance. Told from the points of view of both the police and their targets, the series captures a universe where easy distinctions between good and evil, and.. The most unvarnished, uncompromising and realistic police drama ever returns for another hard-hitting season. McNulty has been demoted to harbor patrol, Daniels is in the police-archive dungeon, Prez is chafing in the suburbs and Gregs is stuck behind a desk. Meanwhile, on the docks of Baltimore harbour, the rank and file scrounge for work and the union bosses take illegitimate measures to reinvigorate business, but a horrific discovery..
Everyone is feeling the heat in Baltimore. The drug war is a losing campaign, bodies are piling up in the street and a desperate mayor demands to see some victories before Election Day. But the police are running out of ammunition. Wiretaps aren't working, and neither are stakeouts or street busts. No matter how hard McNulty and the detail try, the dealers always seem to be a step ahead. Special Features Q&A With David Simon And Creati..
With the fall of the Barksdale empire, and the ascent of a new young drug king in Baltimore, McNolty, Bunk and the rest of the detail continue to "follow the money" up the political ladder amidst a hotly contested mayoral campaign. Prez witnesses first-hand the role of inner-city education in the formation of youth as four students, Michael, Namond, Randy and Dukie, face dangerous decisions and adolescent angst in a city rife with the t.. In a city that can no longer even recognize its problems, much less begin to solve them, police detectives attempt to bring in one last, worthy case against a violent crew of narcotics traffickers. And when bureaucratic poverty and infighting threatens that case, one detective will risk everything, creating a fraud that will eventually entangle the city's newspaper, which is weakened by declines in circulation and advertising. With jour..